This article is live and will be updated throughout the first round matchup between Cal Poly and UC Santa Barbara. The Blue-Green Rivalry was rekindled in the first round of the Big West Tournament as the Cal Poly men’s basketball team took on UC Santa Barbara Thursday night at the Honda Center in Anaheim, Calif.
Strong shooting from three-point range and a dominant rebounding performance sparked an early 13-6 run for Gauchos the first four and a half minutes after the opening tip. On the other end of the court, the Mustangs came out ice-cold, missing all eight of their attempts from beyond the arc in the first half. They couldn’t find much more success in the paint, as Cal Poly was outrebounded by UC Santa Barbara in the first half, 11-24. Less than five minutes later, the Gauchos pushed even further ahead with a 13-0 run to put the Mustangs down 22. Sophomore guard Max Heidegger fueled the UC Santa Barbara deep-range attack, draining three shots from three-point range for nine points. At the half, the Gauchos lead the Mustangs 45-18. The Mustangs made a concerted effort to get to the line in the second half, shooting 16 of their 24 total free throws after the break. Senior guard Victor Joseph narrowed the Mustangs deficit to 18 after a pair of free throws with 7:55 to play. 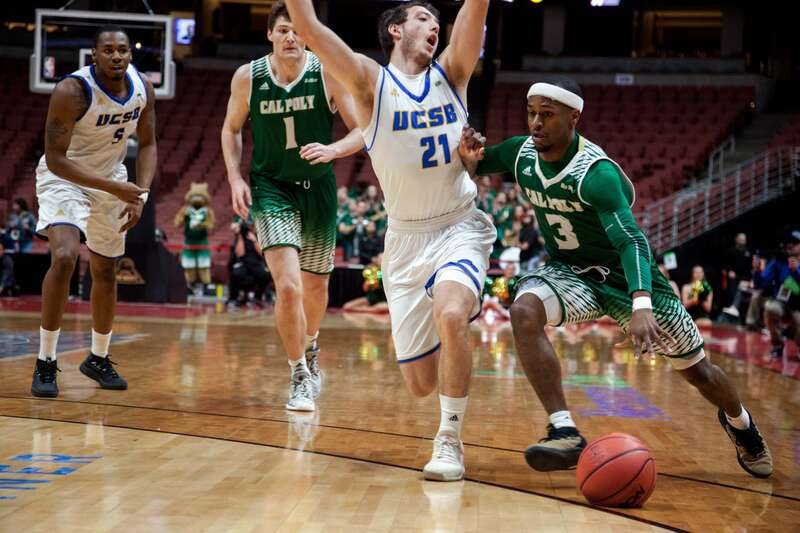 This was as close as Cal Poly would come to a second-half lead, falling 53-75 to UC Santa Barbara. Ultimately, the Mustangs came up short in every phase of the game, only shooting 27 percent from the floor while being outscored in the paint 16-34 and outrebounded 27-43. Though three-point shooting is usually a strong point for the Mustangs, they only managed to knock down three shots from deep in the entire game. The Mustangs finish their season 9-22 and 1-2 against the Gauchos this season. Next season, Cal Poly will look to replace two top-scoring seniors from their team, Joseph and senior forward Luke Meikle.